Domain present in yeast vacuolar sorting protein 9 and other proteins. Rab proteins form a family of signal-transducing GTPases that cycle between active GTP-bound and inactive GDP-bound forms. The Rab5 GTPase is an essential regulator of endocytosis and endosome biogenesis. Rab5 is activated by GDP-GTP exchange factors (GEFs) that contain a VPS9 domain and generate the Rab5-GTP complex [(PUBMED:16330212)]. The VPS9 domain catalyzes nucleotide exchange on Rab5 or the yeast homologue VPS21. The domain has a length of ~140 residues and forms the central part of the yeast VPS9 (vacuolar protein sorting-associated) protein, which acts as a GEF for VPS21. 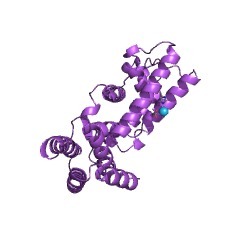 Some domains which can occur in combination with the VPS9 domain are CUE, A20-type zinc finger, Ras-associating (RA), SH2, RCC1, DH, PH, rasGAP, MORN and ankyrin repeat. 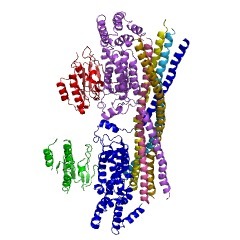 Structurally, the VPS9 domain adopts a layered fold of six alpha helices. Conserved residues from the fourth and sixth helices and the loops N-terminal to these helices form the surface that interacts with Rab5 and Rab21 [(PUBMED:15339665)]. Fungal Vacuolar Protein Sorting-associated protein VPS9, a guanine nucleotide exchange factor for the Rab-like GTPase VPS21. VPS9 is needed for the transport of proteins from biosynthetic and endocytic pathways into the vacuole. Mammalian Rab5 GDP/GTP exchange factor or Rabex-5 (Rababtin-5 associated exchange factor for Rab5), catalyzes nucleotide exchange on RAB5A. Rabex-5 promotes endocytic membrane fusion and is involved in membrane trafficking of recycling endosomes. Mammalian Ras and Rab interactor 1 (RIN1), 2 (RIN2) and 3 (RIN3). 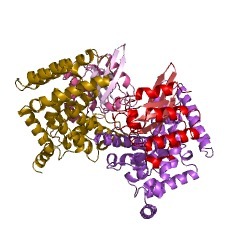 Mammalian alsin or Amyotrophic Lateral Sclerosis protein 2 (ALS2). Different juvenile-onset forms of neurodegenerative diseases (ALS2, JPLS, IAHSP) are caused by mutations in the ALS2 gene, which result in truncated alsin lacking the C-terminal part of the VPS9 domain. Fruit fly protein sprint, which is a RIN homologue. Caenorhabditis elegans RME-6 protein, which is conserved among metazoans. There are 5182 VPS9 domains in 5180 proteins in SMART's nrdb database. Taxonomic distribution of proteins containing VPS9 domain. This tree includes only several representative species. The complete taxonomic breakdown of all proteins with VPS9 domain is also avaliable. Click on the protein counts, or double click on taxonomic names to display all proteins containing VPS9 domain in the selected taxonomic class. Vps9p is a guanine nucleotide exchange factor involved in vesicle-mediated vacuolar protein transport. Vacuolar protein sorting (vps) mutants of Saccharomyces cerevisiae missort and secrete vacuolar hydrolases. 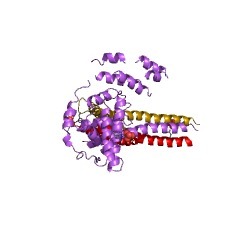 The gene affected in one of these mutants, VPS21, encodes a member of the Sec4/Ypt/Rab family of small GTPases. Rab proteins play an essential role in vesicle-mediated protein transport. Using both yeast two-hybrid assays and chemical cross-linking, we have identified another VPS gene product, Vps9p, that preferentially interacts with a mutant form of Vps21p-S21N that binds GDP but not GTP. In vitro purified Vps9p was found to stimulate GDP release from Vps21p in a dose-dependent manner. Vps9p also stimulated GTP association as a result of facilitated GDP release. However, Vps9p did not stimulate guanine nucleotide exchange of GTP-bound Vps21p or GTP hydrolysis. We tested the ability of Vps9p to stimulate the intrinsic guanine nucleotide exchange activity of Rab5, which is a mammalian sequence homologue of Vps21p, and Ypt7p, which is another yeast Rab protein involved in vacuolar protein transport. Rab5, but not Ypt7p was responsive to Vps9p, which indicates that Vps9p recognizes sequence variation among Rab proteins. We conclude that Vps9p is a novel guanine nucleotide exchange factor that is specific for Vps21p/Rab5. Since there are no obvious Vps9p sequence homologues in yeast, Vps9p may also possess unique regulatory functions required for vacuolar protein transport. 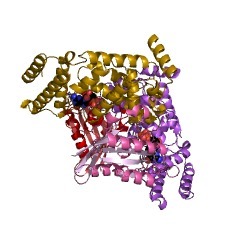 Regulation of the oncogenic activity of BCR-ABL by a tightly bound substrate protein RIN1. RIN1 was originally identified by its ability to physically bind to and interfere with activated Ras in yeast. Paradoxically, RIN1 potentiates the oncogenic activity of the BCR-ABL tyrosine kinase in hematopoietic cells and dramatically accelerates BCR-ABL-induced leukemias in mice. RIN1 rescues BCR-ABL mutants for transformation in a manner distinguishable from the cell cycle regulators c-Myc and cyclin D1 and the Ras connector Shc. These biological effects require tyrosine phosphorylation of RIN1 and binding of RIN1 to the Abl-SH2 and SH3 domains. RIN1 is tyrosine phosphorylated and is associated with BCR-ABL in human and murine leukemic cells. RIN1 exemplifies a new class of effector molecules dependent on the concerted action of the SH3, SH2, and catalytic domains of a cytoplasmic tyrosine kinase. A yeast protein related to a mammalian Ras-binding protein, Vps9p, is required for localization of vacuolar proteins. In the yeast Saccharomyces cerevisiae, mutations in vacuolar protein sorting (VPS) genes result in secretion of proteins normally localized to the vacuole. Characterization of the VPS pathway has provided considerable insight into mechanisms of protein sorting and vesicle-mediated intracellular transport. We have cloned VPS9 by complementation of the vacuolar protein sorting defect of vps9 cells, characterized its gene product, and investigated its role in vacuolar protein sorting. Cells with a vps9 disruption exhibit severe vacuolar protein sorting defects and a temperature-sensitive growth defect at 38 degrees C. Electron microscopic examination of delta vps9 cells revealed the appearance of novel reticular membrane structures as well as an accumulation of 40- to 50-nm-diameter vesicles, suggesting that Vps9p may be required for the consumption of transport vesicles containing vacuolar protein precursors. A temperature-conditional allele of vps9 was constructed and used to investigate the function of Vps9p. Immediately upon shifting of temperature-conditional vps9 cells to the nonpermissive temperature, newly synthesized carboxypeptidase Y was secreted, indicating that Vps9p function is directly required in the VPS pathway. Antibodies raised against Vps9p immunoprecipitate a rare 52-kDa protein that fractionates with cytosolic proteins following cell lysis and centrifugation. Analysis of the VPS9 DNA sequence predicts that Vps9p is related to human proteins that bind Ras and negatively regulate Ras-mediated signaling. We term the related regions of Vps9p and these Ras-binding proteins a GTPase binding homology domain and suggest that it defines a family of proteins that bind monomeric GTPases. Vps9p may bind and serve as an effector of a rab GTPase, like Vps2lp, required for vacuolar protein sorting. 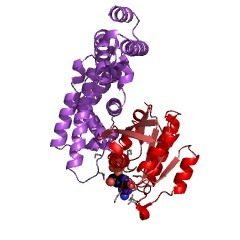 A human protein selected for interference with Ras function interacts directly with Ras and competes with Raf1. The overexpression of some human proteins can cause interference with the Ras signal transduction pathway in the yeast Saccharomyces cerevisiae. The functional block is located at the level of the effector itself, since these proteins do not suppress activating mutations further downstream in the same pathway. We now demonstrate, with in vivo and in vitro experiments, that the protein encoded by one human cDNA (clone 99) can interact directly with yeast Ras2p and with human H-Ras protein, and we have named this gene rin1 (Ras interaction/interference). The interaction between Ras and Rin1 is enhanced when Ras is bound to GTP. Rin1 is not able to interact with either an effector mutant or a dominant negative mutant of H-Ras. Thus, Rin1 displays a human H-Ras interaction profile that is the same as that seen for Raf1 and yeast adenylyl cyclase, two known effectors of Ras. 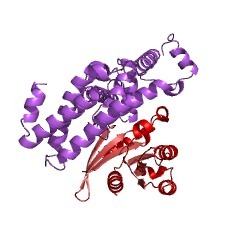 Moreover, Raf1 directly competes with Rin1 for binding to H-Ras in vitro. Unlike Raf1, however, the Rin1 protein resides primarily at the plasma membrane, where H-Ras is localized. These data are consistent with Rin1 functioning in mammalian cells as an effector or regulator of H-Ras.